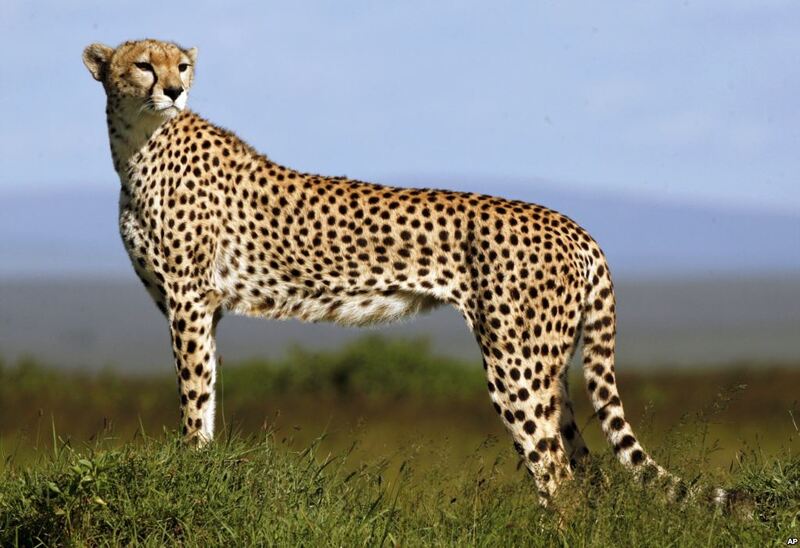 Cheetahs (Acinonyx jubatus) are the fastest land animal. These long-legged cats can run up to 65 miles per hour (100 kph) in short bursts when they are hunting. Cheetahs are shy and are not very sociable with each other.These speedy mammals live for about 8 years in the wild; in zoos, they have a life span of about 10 years. Cheetahs are an endangered species. Adult cheetahs are a rich, tawny brown with dark spots. They have long tear-drop shaped lines on both sides of the nose, extending from the corner of the eyes to the mouth. Adult male cheetahs are up to 7 feet (2.15 m) long, weighing up to 125 pounds (55 kg). Adult females are slightly smaller, up to 6 feet (1.8 m) long, weighing about 100 pounds (45 kg). Cheetahs have a long tail that lets them make very abrupt turns. Cubs have dark fur and are born blind.